Doing some work on my #elgg install on my dev server. playing with some mods. 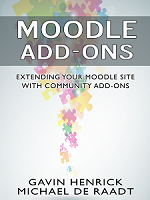 @MoodleDan The idea is #Mahara, some practical use cases (hope they have laptops!) some cases studies and whatever flows..
@mguhlin btw, if you need can talk you through fixing over skype or elluminate if you cant find it. @MoodleDan I am going to #mootuk10 hopefully doing a workshop too, god willing!